The Sony Alpha A7 Mark II compact system camera offers outstanding image quality in a compact size and light build, and it carries on the traditions of the A7 series, which includes the world's smallest and lightest interchangeable-lens full-frame camera (A7R). A 24.3 effective megapixel 35 mm full-frame Exmor CMOS sensor moves along five axes to compensate for camera shake, providing optical image stabilisation equivalent to up to 4.5 steps faster shutter speed of correction for still images. Shooting sharp handheld stills and video is now possible under conditions that may have required a tripod in the past. 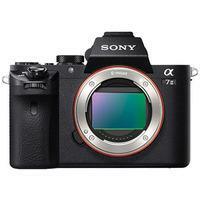 In this and other scenarios, users can enjoy beautifully rendered images from the Sony Alpha A7 Mark II camera's full-frame sensor with the convenience of image stabilisation. Battery NP-FW50, AC Adaptor, Accessory shoe cap, Body cap, Eyepiece cup, Micro USB cable, Power cord and Shoulder strap.